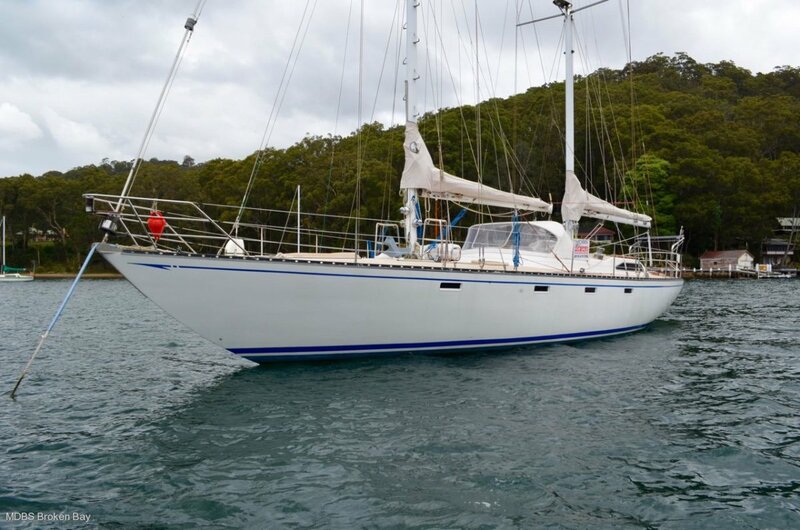 Easily handled, large volume, blue water cruiser in very good condition. Well protected, comfortable centre cockpit. Huge aft cabin with offset double and ensuite. Ambition would also make an excellent live aboard. Lots of storage in the galley on the starboard side. 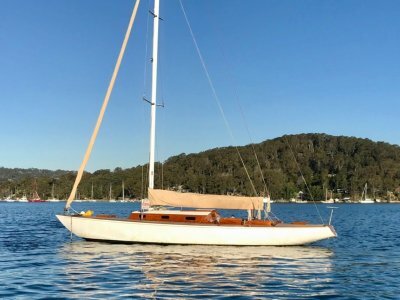 A low maintenance boat with all equipment in its proper palce after years of long distance cruising. The fully comprehensive owners manual coupled with a complete set of maintenance records will make the handover to the new owner a breeze. Antifouled and hull polish December 2016. Lister Marine Diesel 6 Cyl. 88 HP. Onan MDJE 6 KVA Diesel Generator 5 HP Yamaha outboard. Engine room: The engine bay is accessed by four large hinged doors. Two on port and two on starboard, the doors are on slide off hinges for quick removal when servicing. The bay is covered in sound shield material. The main engine has a 200 litre/minute clutch operated bilge pump. Access to through hull skin fittings for engine cooling water and toilet flush water are located in the engine bay. Cooling water to engines are via separate water strainers. High mounted, dry exhaust risers totally eliminate the possibility of raw water entering the engines. The engine waste salt water is used for exhaust cooling and has siphon breaks installed. The final exit of exhaust water is through aqua lifts, non return chambers. The stern gland is connected via a mounted grease gun, eliminating dripping water through the gland. The engine bay has lighting installed for servicing. Offset double in large aft cabin with ensuite. Two bunks in forepeak if required, normally the workshop. The anchor chain is 13 mm x 80 metres and the main anchor is a CQR Manson 80 lb. Also onboard is a 60 lb CQR and 120 lb storm anchor, which is deck mounted for ease of handling. The chain has an electric winch with rope drum and Gypsie for chain haulage. Life lines for both port and starboard. Life ring. Water activated, floating, flashing light. Floating panic kit. All mandatory safety equipment. Life raft in deck mounted canister. Codan HF Radio, Navman VHF radio. Both radios can be switched to the deck speakers for cockpit monitoring. Helm instruments including depth, speed through water, apparent wind direction, Pioneer radio, CD player is installed in the main saloon have speakers piped to the cockpit. TMQ Auto Pilot allows the vessel to be sailed one up, and puts the operator in a roll of monitoring. Installed JFC-790 GPS. This navigator also monitors sea water temp and fish finder, plus speed through the water. Codan HF Radio, Navman VHF radio. Both radios can be switched to the deck for monitoring purposes. Helm instruments including depth, speed through water apparent wind direction and wind expansion. Main, Mizzen, Staysail and Genoa. 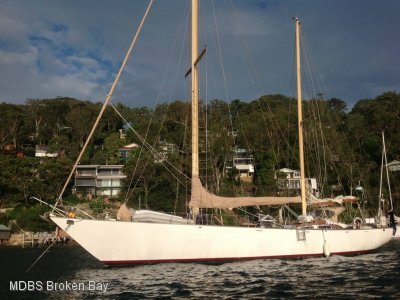 Twin mast sections both of 20 metres in length give the yacht an impressive appearance. Running back stays balance the staysail rig when used in this mode. All standing Rigging was replaced in 2005. Primary winches are Barlow 36, two speed and Secondaries Barlow 32s, two speed. The main sheet winches are Barlow 27 two speed. Three CQR anchors with 80 m 13mm chain and electric anchor winch. A chain wash down hose is provided in the anchor locker. Twin deck lights are located on each mast. Cockpit courtesy lights for both helm position and forward cockpit are installed. LED Lights in dodger overhead bow can be used to light removable cockpit table. Anchor lights to fwd mast head, stern post and bow can be set on auto as a security and safety feature. These turn on and off each night if required. Davits on the stern allow the inflatable to be retrieved single handed. Transom steps allow access from the dingy to the yacht. An 80 watt solar panel is installed above the dingy davits. Port and Starboard Teak Slats provides seating for six persons. Timber boarding plank can be installed off the stern or the bow and set up with a hand rail to assist access from the shore. A stern bracket with roller is provided to deploy an anchor from the aft of the vessel. The rudder is driven via a hydraulic pump operated by the helm. 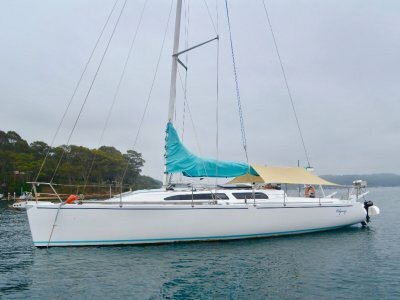 This is a very well organised vessel and the new owner will bless the comprehensive owners manual and detailed maintenance records since launch ! !